It’s the 30th week of the year and the card of the week is the 7 of Swords. 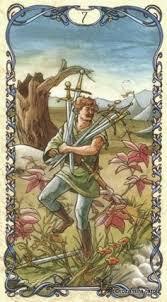 The Seven of Swords is a sneaky, two faced guy (or gal) who uses their friends for their own personal gains. This week is a week where a lot of power is available to you. This could make others jealous of you so beware the back stabbers. The number of the week is 3, a number of things coming together. 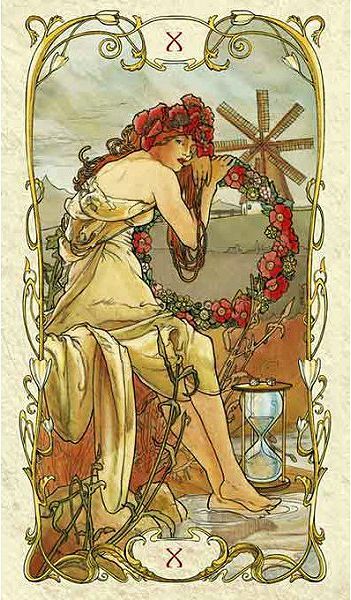 The Wheel of Fortune is a card that appears when your luck is about to take a turn, usually for the better. However, from my experiences, this card is a wild card and you should expect the unexpected. Imagine watching a roulette wheel spin and you’re not quite sure where it’s going to stop. So there’s also an added element of anticipation from waiting. Judging from the Moon sign, Venus transit and the number for today, these twists of fate will most likely involve love and relationships. Moon trine Neptune at 9:51 AM PST will find you feeling empathetic and compassionate. Your intuition will be sharp this morning in your dealings with others. Moon opposite Pluto at 5:03 PM PST could bring big breakthroughs through intense encounters. These experiences may not always be pleasant but they’re meant to clear the air. Venus trine Uranus at 9:07 PM PST could bring radical and exciting new encounters in love. The Moon is in the emotional sign of Cancer, encouraging you to embrace your sensitive side. The number of the day is 2, a number of partnerships. Mantra: Fate happens when you least expect it. 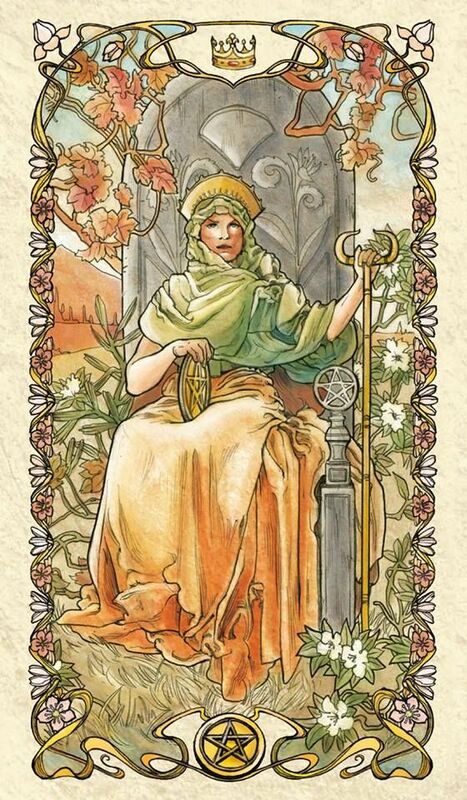 The Queen of Pentacles is the epitome of fertility and wealth, an appropriate card considering that today is Laughnsadh. It’s the celebration of the first harvest and the Queen asks you to consider what you have to be thankful for. Where do you see bounty and goodness in your life? Take time to give thanks today. Moon sextile Jupiter at 4:25 AM PST brings happiness, harmony and optimism to your day. Be generous and give to others to show your thanks for what you have. Moon square Uranus at 8:31 AM PST will bring a break from the ordinary with out of the ordinary excitement. Sun trine Saturn at 10:49 AM PST will bring discipline and focus. Moon trine Mars at 5:44 PM PST will give you the courage to lead if called upon to do so. The Moon is in Cancer until it goes void of course between 5:44 PM PST and 6:12 PM PST. It will enter the bright, shiny, sign of Leo, reminding us that the sun shines upon the fertile land and brings the harvest with it. The number of the day is 9, a number of endings and beginnings. Mantra: I give thanks for the many blessings in my life. 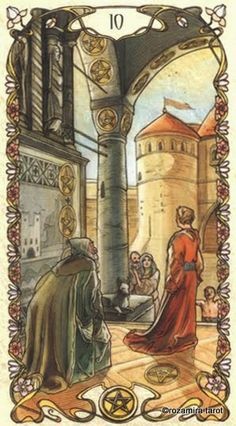 The 6 of Cups is a card of nostalgia. When it appears, expect an unexpected visit from someone from your past or a sudden memory of times gone by. If you are struck by how much things have changed, remember, nothing stays the same. Mars enter the energetic sign of Sagittarius where He will stay until 9/27/16. When Mars is in Sagittarius, people will be on fire to right for their ideals. The New Moon in Leo will amplify this firey energy to set your intentions and harness your passion. 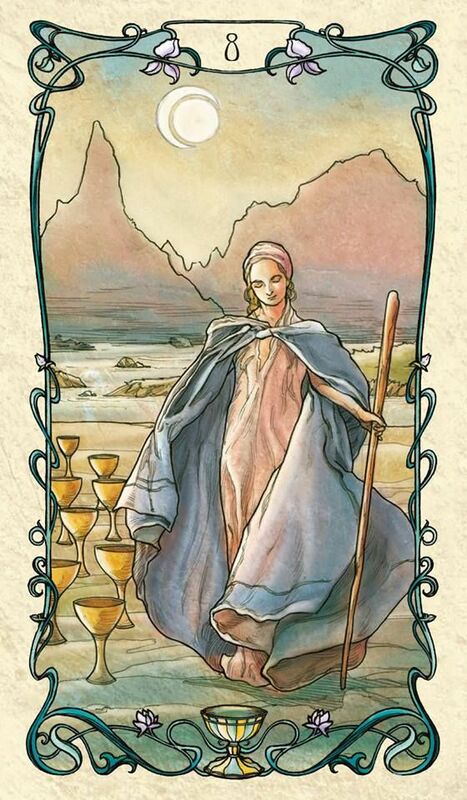 According to the 6 of Cups, the things you choose to fight for will most likely issues that you have a history with. The number of the day is 2, a number of balance. Mantra: The things to fight for are the things you believe in. 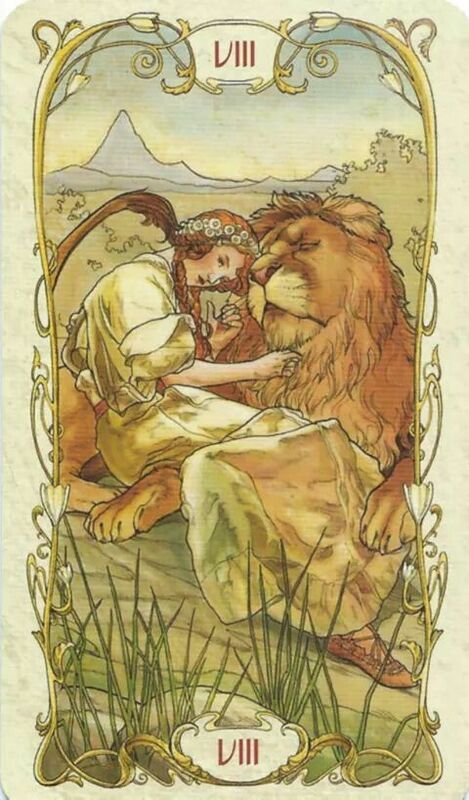 The Strength card appears when you are called on to look within you and face your fears. If you treat yourself with loving kindness, then you will see that you really are stronger than you think. Because of the Leo Moon and the fact that the Strength card is ruled by Leo, it’s a day for making impressions so don’t let important networking opportunities pass you by. Moon trine Uranus at 2:22 PM PST will make you want to get out, meet new people and try interesting things. Moon conjunct Venus at 9:13 PM PST add to the adventurous energy of the day. The Leo Moon will be particularly strong so if you’re feeling it, do something to shine your light and love on those around you. There is also a potential for romantic encounters. The number of the day is 2, a number that reminds us that the most confident people shine confidence from the inside out. Mantra: I am worthy of everything I desire. 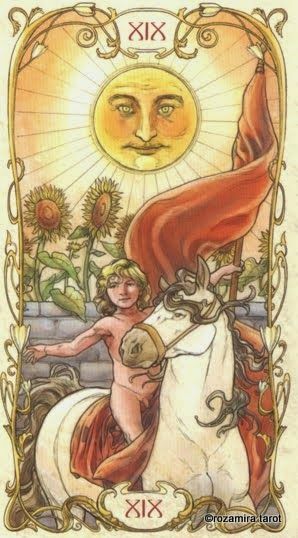 Whereas yesterday’s card was Strength, today’s card is the Sun. You’re still glowing with confidence from yesterday and people are sure to notice. Continue to use your radiance to draw influential people to you. The only problem is that your light may be so strong that it blinds others and may cause them to try to pick at you. Don’t let it get you down. Moon square Mars at 1:43 AM PST leave you feeling ready to explode. If this transit occurs while you’re sleeping, you may wake up in the middle of the night from bad dreams. Moon square Saturn at 7:02 PM PST could bring fleeting pessimism. Remember that nothing lasts forever. Moon opposition Neptune may bring skewed intuition and feelings of guilt. The Moon is in the persnickety sign of Virgo so don’t take criticism to heart and hold true to your convictions. The number of the day is 3, a number of things coming together. Mantra: I’m strong enough, I’m tough enough, I’m bold enough. Because you’ve been so powerful over the past couple of days, your light may have left some people feeling intimidated. These people may shy away from the energy you’re radiating because they’re not on the same vibration as you are. It’s OK. Let them walk away. Moon trine Pluto at 5:53 AM PST may cause you to lay your cards out on the table and tell it like it is. These strong feelings may lead to breakdowns but that’s to highlight areas in your life that need improvement. Venus enters Virgo at 8:27 AM PST where she will stay until 8/29/16. When Venus is in Virgo, people may feel more sensitive and withdrawn. People will be won over by quiet subtleties rather than direct communication. The Moon is in Virgo for a good part of the day, so pay attention to the details in all encounters today. The number of the day is 4, a number of stability. The 10 of Pentacles is a sign of complete wealth and abundance. You will find great happiness and satisfaction in all that you’ve created for yourself today. However, remember that if you’re too focused on material things, you may not be paying enough attention to what’s going on at home. Make sure to give thanks for it. Mercury square Saturn at 6:18 AM PST may leave you feeling so logical that it’s difficult to communicate with others. This transit may also bring a sad goodbye that will be better in the long run. Moon sextile Mars at 1:06 PM PST will leave you feeling a surge of confidence. Venus square Mars at 5:20 PM PST could bring tensions in your love life. Resolve this with sexual energy. This transit can be a test of relationships. The Moon is in the balanced sign of Libra for most of the day, reminding you that every coin has two sides. The number of the day is 5, a number of overcoming conflict. 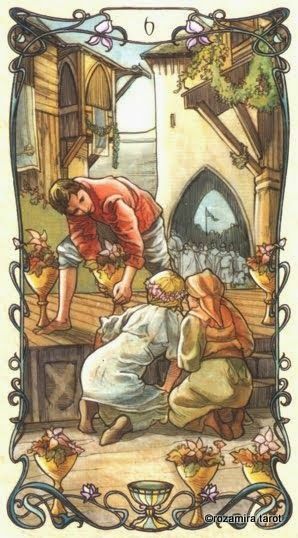 Because 5 is half of 10 and the card for the day is the 10 of Pentacles, you will be shown the missing half that is preventing you from enjoying maximum abundance. Magdalena Tarot does not claim the rights to any of the Tarot card images used here. All images are from Le Tarot Des Femmes Erotiques deck. This entry was posted in art, Astrology, dreams, mysticism, mythology, numerology, occult, photo shoot, self help, spirituality, Tarot, Uncategorized, witchy, Writing and tagged abundance, art, astrology, card a day, divination, dreams, empowerment, inspirational, magick, manifestation, mantra, meditation, metaphysical, motivational, mysticism, numerology, occult, pagan, predictions, self empowerment, self help, spiritual, spirituality, tarot, tarot reading, tarot weekly forecast, wicca, witchcraft, witchy, writing. Bookmark the permalink.